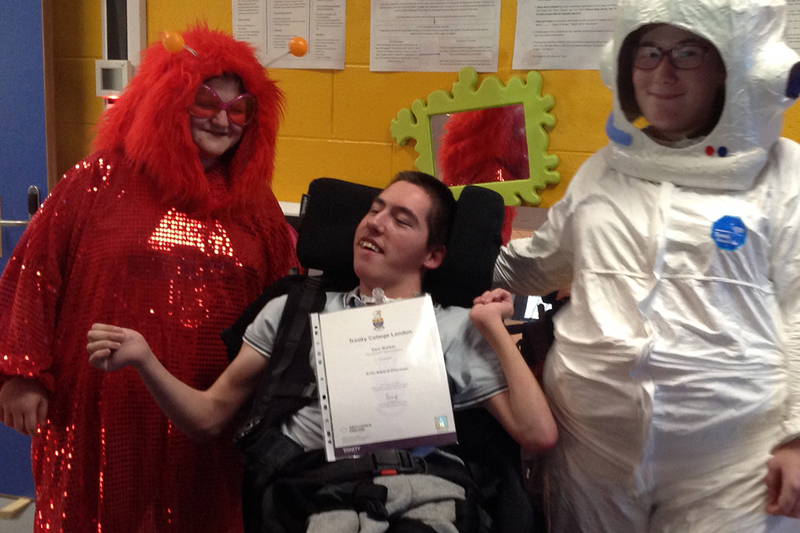 Congratulations to the 49 young people with PMLD on achieving their Discover Arts Awards through DIY’s Give Me Space! programme this year!!! As DIY’s Give me Space! tour comes to an end, we have just completed the last of our Discover Arts Award projects with young people with Profound and Multiple Learning Disabilities at Bury College. We have been privileged to meet so many fantastic young people as part of these projects and have really enjoyed developing our relationships with the schools and colleges involved. Our students don’t get to see new people very often, so it’s nice to have new people coming in. I think they get new experiences and they get to meet and work with yourselves. Members of DIY’s Friday Leadership Group have been working with groups of young people at Delamere School, Piper Hill School (2 projects), Firwood School and Bury College to achieve their Discover Arts Awards. DIY actors visited venues before the show to introduce some of the props, characters and songs from the performance. We introduced the Social Story*, as a way of preparing audiences for what they are going to experience when the full company performs the show. The learners became the audience and experienced DIY’s multi-sensory show “Give me Space!” This show has been really popular. During the performance the audience travels to other planets and meets new civilisations. Their multi-sensory journey is enhanced by original live music and interactive props, created with designer Nerissa Cargill-Thompson. DIY asked the learners to create their own space puppets to compliment the songs from the show. The space puppets are shared with the DIY team and each-other at a follow-up workshop. The students had all worked really hard, learned lots and a lot of fun along the way. We were so pleased to find out that 49 had successfully achieved their DISCOVER Arts Award. We really enjoyed handing out the certificates to students at Bury College and seeing so many proud and happy faces. It’s nice to work with different people and to work in different ways – because you do things differently from us and that gives us all new ideas. We are always sad to wave goodbye at the end of each project but we leave gifts behind to remind the groups of our time together and, we hope, stimulate further artistic work. A resource pack with different materials which has been compiled by our designer Nerissa Cargill-Thompson. And of course DIY has lots of exciting projects planned for 2019. Keep up to date with what we are doing by connecting with us on social media or watch this space for more details!